Just when you thought things couldn't get any better, this Art Deco Pearl Necklace lands on our shelves and everything seems more magical. Statement making jewellery is our seasonal crush so this tassel pearl necklace is a absolute winner for bringing life and speakeasy style to your look. The combination of pearl, diamante and deco design is just beautiful and the perfect way to work vintage style into your wardrobe. 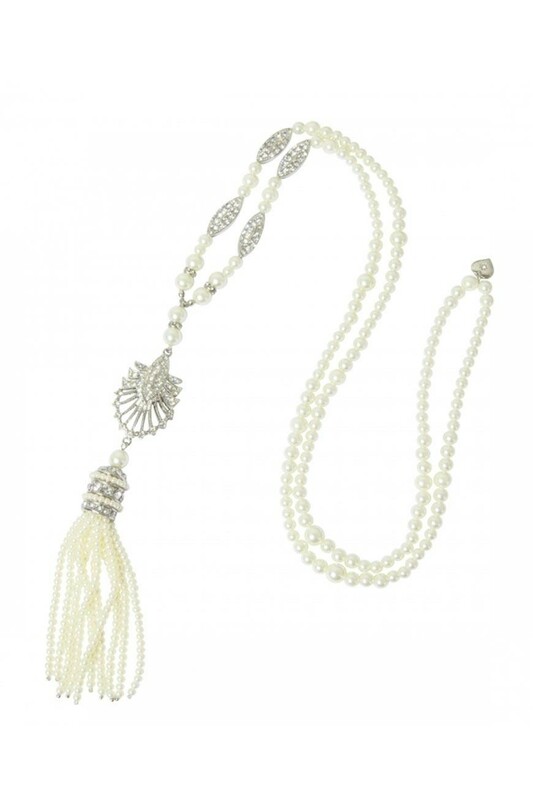 Clearly, this pearl flapper necklace will look the business on a beaded 1920s dress but it also looks fab on a black silk top or a lace LBD so it will continue to work hard for you whatever the occasion. - Pearl and diamante long necklace loop (classic flapper action). - Central silver tone metal art deco fan (Gatsby glamour nailed). - Drop tassel of pearl strands held on silver and diamante bauble (Swish, swoosh, play).